A quick reminder: Huggies put out a video that made it seem like their diapers were so good, even dads could use them. It was dumb and offensive, everyone agreed. However, while some people were offended more, seeing the commercial as an example of brands disregarding dads and being stuck in an old parenting paradigm, others (well, me) saw this is an accidental offense we should note, try to change, and then move on. 1. The bloggers who complained about Huggies and about its parent company, Kimberly-Clark, were approached by Kimberly-Clark's top management. The heads of Kimberly-Clark flew down to a blogging conference to speak to offended dads. Other dads were approached by phone to participate in round-table conversations with the heads of the company, chatting about the direction in which Kimberly-Clark brands would target their marketing. I know the company (and its PR company) knew about my own pro-Huggies post, because I checked my visitors' stats and saw them visiting hour after hour, day after day, methodically reading the blog/Facebook comments. However, I received no call. My input wasn't necessary. I wasn't a social media problem, so I didn't need to be appeased by round-table conference calls. So what's the lesson? Never be pro-anything! Always criticize. You think the Internet has gone too far lashing out against a company? Well, be your own devil's advocate and think, "Sure, I can come to the defense of the company, but what's in it for me? On the other hand, I can criticize the company and threaten to add to the social media firestorm, and be treated like a celebrity!" 2. While the first lesson aims to illustrate the possibility that the Huggies outreach to bloggers had been a hypocritical attempt to put a fire out rather than a good faith effort to do right by dads, the second lesson, as illustrated by the picture below, is much more interesting. 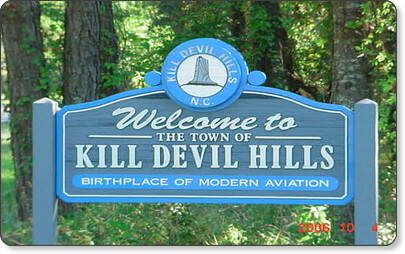 There's a place called Kill Devil Hills! The name Kill Devil Hills dates back to the Colonial era. Shipwrecks were common at the time, and many of the ships were transporting barrels of rum. When a ship foundered, local wreckers would scavenge what they could of the ship's cargo before it sank, hiding their pilfered rum behind, and sometimes in, the same large sand dunes where the Wright Brothers would later perform glider tests, before flying their first plane from level ground nearby. Since rum was called "Kill Devil" by the English at the time the dunes became known as "Kill Devil Hills." And the official photo on the town's official website includes a date-stamp, which is a nice touch! It's a very interesting situation because the agency guys that did the Huggies ad, which was SO bad, also did the Dove Men Care ads for March Madness that were SO good. And our conversations with them were very candid and we did ask them to do more to show parents working together, show dads in direct care of their babies, and even push the boundaries by showing gay couples in their advertising, but I doubt that last one will happen any time soon. I guess what I'm saying is that we weren't being treated like a PR problem. It never felt that way to me. And their "Mommy Answers" has always been on their website. I specifically asked them to change it to something for new parents or to add a link to info for first time dads. That is where education is lacking. Hospitals, doctors, and authors are great at educating moms, but nobody really talks to new dads. Big changes take time. For now, they're still "on notice" and I've got my eye on them. I had a very candid talk with someone from Huggies about this today. And while I can't say "Mommy Answers" fits my perfect world where everything can be just marketed to "parents," in this reality, where they are (with this campaign) specifically and intentionally targeting pregnant, first-time moms, calling it "Mommy Answers" is understandable. Targeting expectant moms is not the same as excluding dads, basically. More importantly, from a personal standpoint, my worries that this was a sign that all of our previous conversations were pointless or staged have been alleviated. I want to respect that a lot of what I was told was off-the-record, so I'll just say that they're taking the issue of including dads in a meaningful way seriously, at the highest levels, and I'm excited to see what they have in store. That doesn't surprise me one bit. Put out the fire should be a top priority, but to ignore someone who supports them is a poor choice. I guess I should be happy they are trying. It's sad that that is the standard that would give them a pass in most peoples minds. We should expect more. anordinarydad, Huggies Dads sit in front of the TV for hours while waiting for their wives to come home and change diapers. 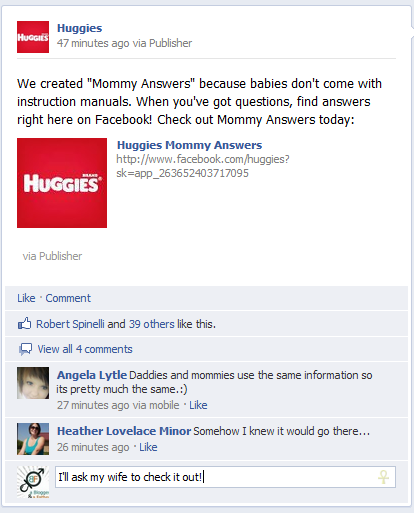 And if the wives come home and see a rash, they should check Huggies' Mommy Answers. Huggies Dads are happy to go to the store if the moms want some cream or whatever it is babies need. Matthew, first of all, many companies have had gay couples in ads, so Huggies wouldn't be breaking boundaries here. Here's the new Ray Ban ad. The Huffington Post article includes a bunch of other commercials. The problem with Huggies is that they're willing to push boundaries as long as the message remains the product and as long as established stereotypes are not endangered (because then the controversy might become the message). I've just seen the Dove commercial for the first time, and I don't think it's any different. It's nice to see a loving dad in a commercial, especially because amazingly enough, many men still think taking care of children is un-manly, but while the boy becomes a man who is "comfrotable enough in his own skin" to take care of his children, the commercial ends with his real natural habitat: lying down by his beloved grill. Chris, it's good to hear, although right now it's not much more than words. Don't get me wrong, they can do whatever they want. In my original post I mentioned other companies that were much worse in my opinion, so I never shared the anger toward Huggies. At the same time, I didn't share the enthusiasm about them responding to criticism and reaching out. They came out with a marketing campaign that was offensive to dads during a dads' convention, so what were they supposed to do? I understand what you're saying about targeting moms rather than excluding dads, but it all seems to be following a pattern: Moms, buy our products, participate in our community, nominate a dad, and watch some other dads who are so awesome, they're willing to have their pictures taken with a child! Good for Huggies, but it's far from them treating involved dads as anything other than curiosities. somehow I missed this whole story -- maybe because my kids are (blessedly) potty-trained now, or maybe I've just been under a rock lately. But as someone coming late to the party, I'll just add that this whole "even dads can do it" approach makes me think of the way people say dads are "babysitting the kids" when mom goes out but mom is just "parenting" when dad goes out. Grrr. Thankfully my husband doesn't consider it babysitting. As for Kill Devil Hills, it's gorgeous -- you should totally plan a trip to the Outer Banks (says the NC girl). Convertible Girl, this story was a big deal a month ago. 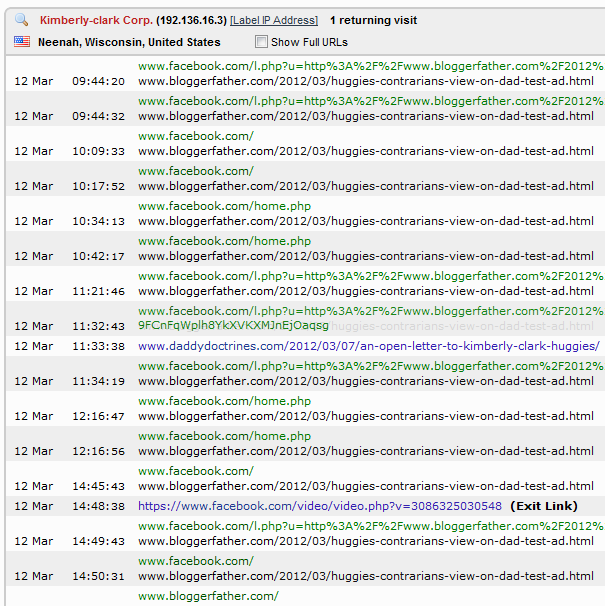 It got so bad for Huggies, that they had to send their top people to a blogging conference to pretend they cared. I took an opposite view at the time, mainly because Huggies didn't ignore fatherhood like Amazon does with Amazon Mom, but simply didn't get changes that have been happening in the last 50 years... But the Mommy Answers is just as bad as Amazon. It makes the whole outreach to dads they made after the controversy came out seem contrived and phony. So really though, dads can't do anything right in our society and neither can moms is what I'm getting. Dads are supposed to be these bumbling idiots. Meanwhile, mom is supposed to keep track of every last paper and email that comes from school, read them all and never forget a single detail, plan perfect birthday parties, never let their kid miss a classmate's birthday party, provide all the perfect items for every science fair if not do the entire project herself, bake for school functions, volunteer in the classroom, arrange babysitting after school and for holidays, schedule and transport to and from after school activities, etc. etc. etc. And even if she's working full time, if she forgets an important paper or an early dismissal day or to bring her kid to a birthday party she's probably neglectful if not downright abusive. It's totally unreasonable on both sets of expectations. Surely there must be some kind of happy medium somewhere. Jill, I think moms can do a lot, but moms who feel the need to be called Mommy by a diapers company may be a little needy. I mainly use 7th Generation diapers, which at least seems more natural. Unfortunately, they've recently collaborated with the Lorax people, so now instead of being the leading all-natural brand, they're just the brand with the least-known BS character. It's very sad that they felt they had to do that, but I guess companies have the right to make dumb decisions. That's what I saw when I tried to find some! I'm pretty sure when Jared was a baby the 7th Generation didn't have those gel things in them. But now they have them I think, right? I'm not sure about the gel. But I do feel that by making their diapers even just appear less natural means they're no longer the go-to brand for the large guilty-about-not-using-Bum-Genius market.